REDDING, Calif. - In an era of text messages and social media, a group of Simpson University and Juniper School students spent the past few months getting to know each other via pen and paper. The pen-pal partnership between 21 college students in professor Mardy Philippian’s English classes at Simpson and 21 third-graders in Karen Lawrence’s class is part of Juniper’s “No Excuses University” initiative, a national program that seeks to prepare students for college. Each class at Juniper is “sponsored” by a university. Many of the teachers partner with their alma maters, including Lawrence, who earned her bachelor’s degree and teaching credential from Simpson University. Each Monday students wear T-shirts from their university, and teachers discuss various aspects of college life, Lawrence said. This year she took the partnership a step further and asked Philippian, whose sons attend Juniper, if his students might be interested in exchanging letters. Philippian introduced the idea in his Survey of British Literature and Shakespeare classes, encouraging the idea of mentorship and university service to the community. The students were randomly matched, and the pairs exchanged three sets of letters, with Philippian and his wife, Serena, acting as mail carriers. “My students asked about what college life is like and if they liked their dorms because we talk about dorms and classes,” Lawrence said. Both sides shared personal information about families and pets. The letters often included drawings—Philippian, who co-directs the faculty-in-residence program at Simpson and lives with his family in a campus residence hall, said he saw Juniper student artwork posted in hallways and on his students’ doors. On Dec. 9, Simpson students visited Lawrence’s classroom to meet their pen pals and enjoy some face time over hot chocolate and Christmas cookies. Her students were thrilled with the visit, she said. On a practical level, the pen-pal partnership—which will continue in the spring semester—provides good writing and editing practice, as well as a balance to technology, Lawrence said. Philippian addresses the same thing with his students. Photos courtesy Karen Lawrence and Mardy Philippian. 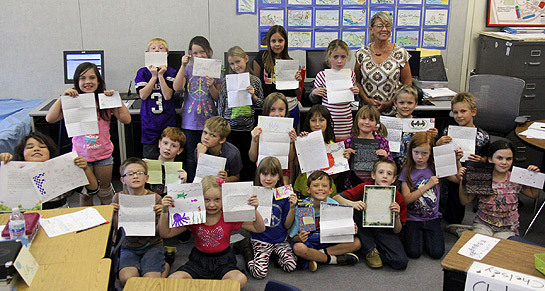 Group shot: Karen Lawrence's class at Juniper School holds up letters received from Simpson University pen pals. 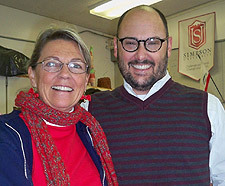 / Juniper teacher Karen Lawrence and Simpson University English professor Mardy Philippian. 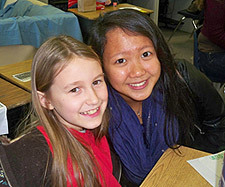 / Juniper student Ashlyn Michaels, left, enjoys time with her Simpson University pen pal, Clara Law.